There are eight species of lovebirds found on the African continent, all members of the genus Agapornis. 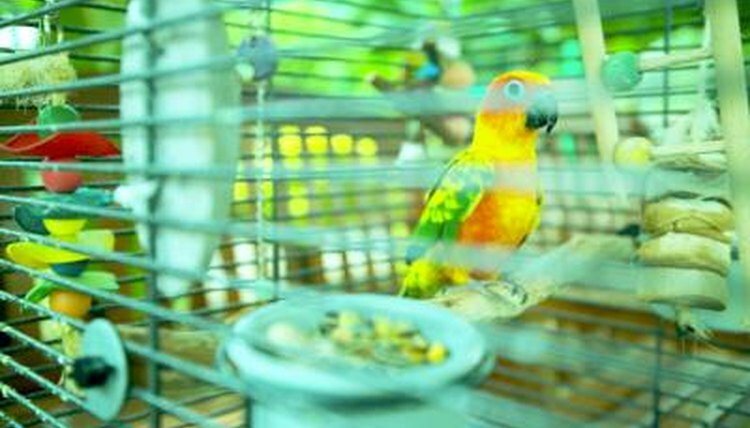 They are small parrots, from 5 to 7.5 inches in length, with short, blunt tails and large, broad hooked beaks. They are most often found living at the edge of forests where they feed largely on seeds, fruits and grasses. Peach-faced lovebirds (A. roseicollis) are found in southwestern Africa. They are predominantly green with rosy pink foreheads, chins, cheeks, throats and upper breasts. The rump and tail are bright blue and their beaks are beige colored. Fischer's lovebirds (A. fischeri) are found in primarily in Tanzania. They have orange faces that blend to brown by the back of their heads. Their eyes are surrounded by a white ring and their cheeks are dark orange. Their throats are a light orange that fades to yellow on their belly. The rest of their body is bright green with the wings a shade darker. Masked lovebirds (A. personata) are found in central Tanzania and northeast Kenya. They are mostly green birds with dark brown or black masks completely covering their heads except for a white ring around their eyes and a red beak. Their upper breasts are yellow and the color extends around their necks in a broad collar. Nyasa lovebirds (A. lilianae) are found in Malawi, Mozambique, Tanzania, Zambia and Zimbabwe. They have light green bodies with darker wings. Their foreheads and throats are orange red with the color fading to salmon as it travels to the crown of the head, face and breast. Their tails are green with yellow or orange borders. They have white eye rings and red beaks. Black-cheeked lovebirds (A. nigrigenis) are the most endangered of the lovebird species. They are found only in a small area of southwestern Zambia. They have light green bodies with darker wings and tails, and orange throats. Their cheeks are black and the color extends around their eye rings that are white. Their beaks are red and their foreheads are reddish brown. Abyssinian lovebirds (A. taranta) are found in the highlands of Ethiopia. They are the only species of African lovebirds in which the sexes look distinctly different. The males are emerald green with bright red foreheads and dark pink beaks. The underside of their wings and flight feathers are black. The females are a more subtle shade of green with no red or black markings and dark pink beaks. Red-faced lovebirds (A. pullaria) are found in equatorial Africa from Sierra Leone to Uganda. Their backs and sides are bright green blending to yellowish green on their bellies. Their foreheads and faces are bright red as are their beaks. The undersides of their wings are black and their tails are blue with small amounts of red, yellow and black. Black-collared lovebirds (A. swindernia) are found in equatorial Africa. They have green heads and black beaks with yellow bands around their eyes and a narrow black collar around the back of their necks. Their rumps and tails are bright blue and red, their breasts orange and their bellies yellow.